This function automatically colorizes line art using AI technology. ·This function is a technology preview. Try out these features before their official release. ·This function sends the created image to a server with the AI module, which will automatically processes the tones. A network connection is necessary to execute this function. ·The author of the image retains the copyright for both the image uploaded to the server and the generated image. No rights are transferred to CELSYS,Inc. Further, the provided image data is never released. ·However, uploaded and generated data may be used for future AI related research and development by CEL­SYS,Inc. It shall only be used for research and development of AI and not for any other purpose. When creating a selection and executing [Colorize (Technology preview)], the effect is applied to the selected area only. Based on the what is drawn on the layer, the image is automatically colorized. Select the line drawing to automatically colorize. (1) Select the layer with the line drawing in the [Layer] palette. (2) Click [Set as Reference Layer] in the [Layer] palette to specify it as the reference layer. Please only use one line drawing layer. Select the [Edit] menu → [Colorize (Technology preview)] → [Colorize all]. A raster layer reflecting the coloring result is newly created above the selected layer. In addition to the outlines, a layer that specifies the colors used as a hint to automatically colorize can be created. Set the line drawing image to colorize as the reference layer. Creates a layer to specify colors as a hint for the colorization. (1) Click [New Raster layer] to create a new layer. (2) Draw the colors to use as hints for automatically colorizing the image on the created layer. Please create a single hint layer. Select the hint layer and choose [Edit] menu → [Colorize (Technology preview)] → [Use hint image and colorize]. A raster layer reflecting the coloring result is newly created above the line drawing layer. The hint layer is hidden. In addition to the outlines, a layer that specifies the colors used as a hint to automatically colorize can be created. Before confirming the [Col­orize] function, use the [Colorize] dialog box to adjust the coloring. ·Please create a single hint layer. ·It is recommended to use at most 10 colors as hints. The more colors are used, the more time it takes to pro­cess and perform automatic colorization. Select the hint layer and choose the [Edit] menu → [Colorize (Technology preview)] → [Use more advanced settings]. When the [Colorize] dialog box is displayed, set the automatic coloring method. The preview of the [Colorize] setting dialog box is displayed on the canvas, so adjustments can be made while checking the results. (1) Activate [Analyze colors and colorize]. (2) Select the color to adjust for the output. 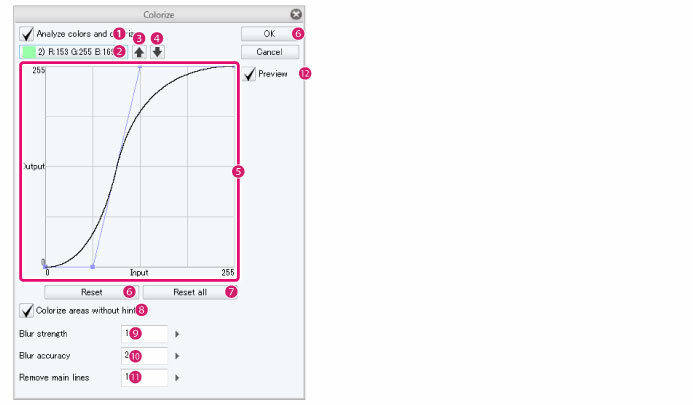 (3) Adjust the output of each color by modifying the graph. (4) Perform the step (2) and (3) operations for each color. (5) Activate [Colorize areas without hints]. For details on the [Colorize] dialog box, see "Colorize dialog Box" . 5The automatic colorization is complete. When active, automatic coloring is performed for each color on the hint layer. The color output can be adjusted with a [Tone Curve]. Select the color to adjust with the [Tone Curve]. The display order of the pull-down menu reflects the processing performed for overlap­ping colors. The hint color is displayed under [Select color]. If there are more than 10 hint colors, 10 colors with the largest areas are extracted. Moves the color selected under [Select color] one step up. Moves the color selected under [Select color] one step down. Adjust the output of the color selected under [Select color]. Drag the control point to adjust. Resets the tone curve under edition. Resets the content being edited for tone curves of all colors. When active, the same coloring result as when executing [Colorize all] is synthesized. 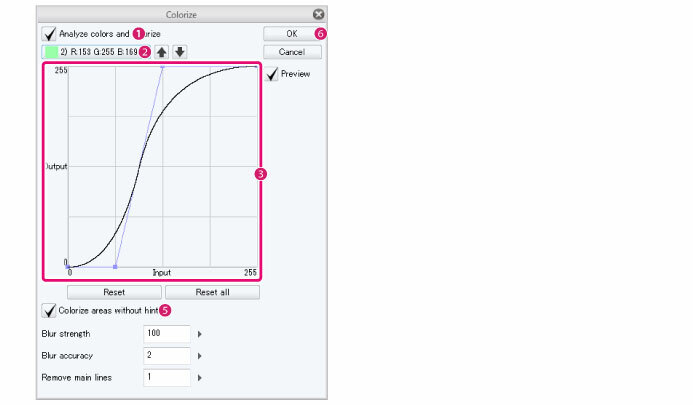 Sets the intensity of blurring the coloring results for lines and line boundaries. The larger the number, the more blurred the colors are. Specifies the number of times to calculate the blur. The larger the number, the smoother the blur effect will be. By expanding the bright areas of an image, the main lines become less visible. The larger the value, the wider the bright areas become. When active, the image is previewed on the canvas.